Grades 1 & up. Spark discussions on the first day and beyond. 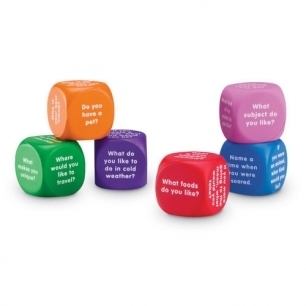 Colorful cubes feature 36 engaging questions about student experiences and perspectives, including: What are you most proud of? Who is the bravest person you know? and What foods do you like? Use in presenting character development activities; brainstorming before writing; and building oral language, social, and listening skills. Also supports fluency in ELLs and students with speech impairments. Includes activity guide. Soft foam cubes measure 1 5/8". Set of six.